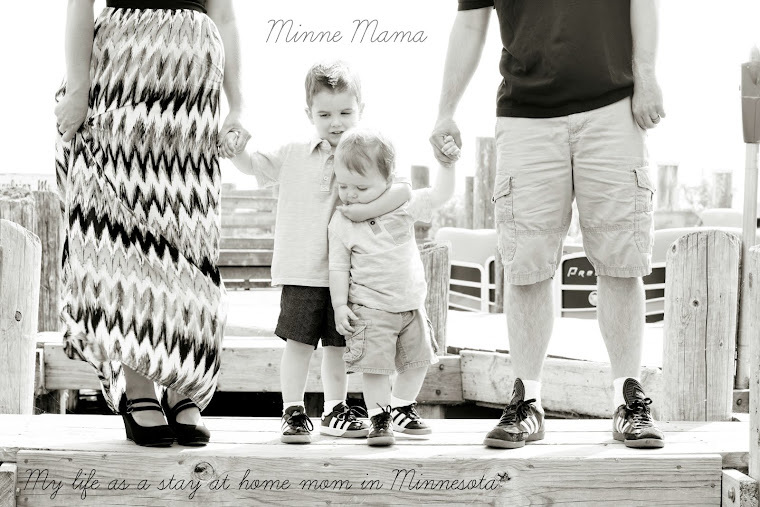 Minne-Mama is on Facebook! 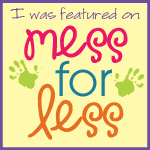 'Like' us to stay updated on our fun crafts and activities! Skyler has always been great about picking up his toys and books, and with the use of the labels on his shelves, he has gotten even better about that! He gets really excited to help pick up his toys, and we usually make it into a game. He picks out toys of a certain color, shape, or type and a lot of time, with soft blocks or balls, we use the bins as baskets and try to throw the toys in. It is the one thing that Skyler has to help me with. When Skyler is awake, I don't like spending time doing housework, I want to be interacting with him, but there are times when I will quickly sweep the floors or load some dishes in the dishwasher. 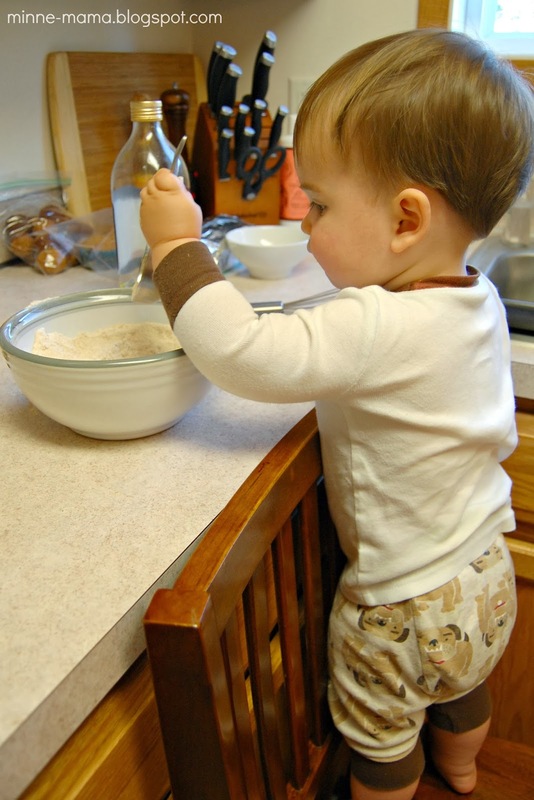 Around the time Skyler turned 18 months, he became very interested in everything I was doing around the house. So lately, I have been making the effort to let Skyler help me more. Things I would normally do when Skyler was sleeping, like hand washing dishes or switching out the laundry, are things that I can modify to get Skyler involved. 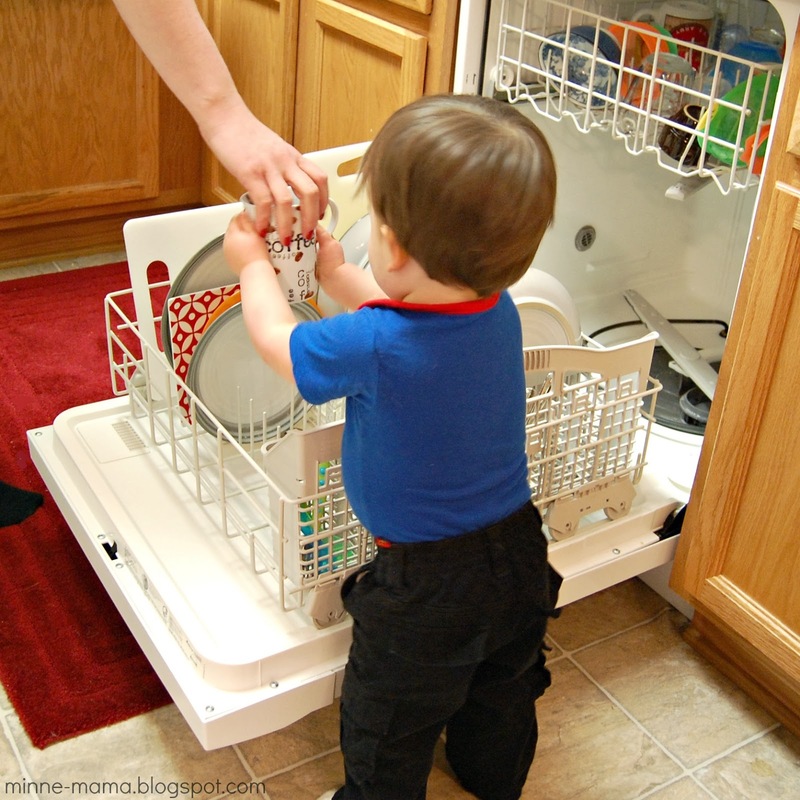 There are many ways to have toddlers help in the process of picking up their own things, as well as learning how to do other household tasks. This is something that I only do when Skyler wants to help, and other than picking up his toys, I would not give him any sort of 'chores' at this age. But, wow, baby boy wants to help me with everything, and it is pretty awesome! Is it time consuming? Absolutely. Is it about getting everything clean and done in the way I normally would do it? Definitely not. But, when we have time and there is a good opportunity for him to help me, we take advantage of it! The look on Skyler's face when he does something to help me is amazing, so proud and excited of what he has done! Skyler also enjoys washing dishes in the sink. Sometimes if there are dishes already in there, I will just add some soap and water and let him wash that (usually a pan or his high chair tray), but sometimes when I am trying to finish dinner or get something in the kitchen done, I will pull out the bowls and utensils that Skyler plays with as 'drums' and he will wash those. If it is a dish that is actually dirty, I will give it a quick wash later, but he actually does a great job at this! Self Help: Skyler is learning many ways to take care of himself. Though I need to get a step stool for him, he will now wash his hands on his own, getting soap and rubbing his hands together under the water as I hold him. He will also wash his hands with a wipe if I give them to him, and then will wash his mouth off as well. He always brushes his own teeth (and I will help a little bit if he is not really interested in it), and after baths he combs his own hair. Bath Time: Skyler has been loving bath time lately, so he takes a long warm bath almost every night. When we finish up dinner, I tell him he is going to go take a bath. Lately, he will walk into his room, open the drawer with blankets and grab out the one we use to get him ready after his bath. He also gets his towel and face wash out of his closet, and picks out the toys he wants to play with during bath, which we keep in a bin in our bathroom. Cooking and Baking: This is definitely the most time consuming task that Skyler helps me with, but it is one of his favorites. When cooking or baking, Skyler will help me measure, pour, and mix. I won't let him watch if the stove in on, but other than that, he will usually stand next to me and watch if it is something he cannot really help with. Cleaning Floors: Skyler showed so much interest in sweeping every time I got out the big broom. A few months ago I bought him this small broom and dust pan so that he could sweep with me. Skyler uses his broom every day! After meals, he will usually sweep the floor around his high chair if he sees food on the floor (without me asking! 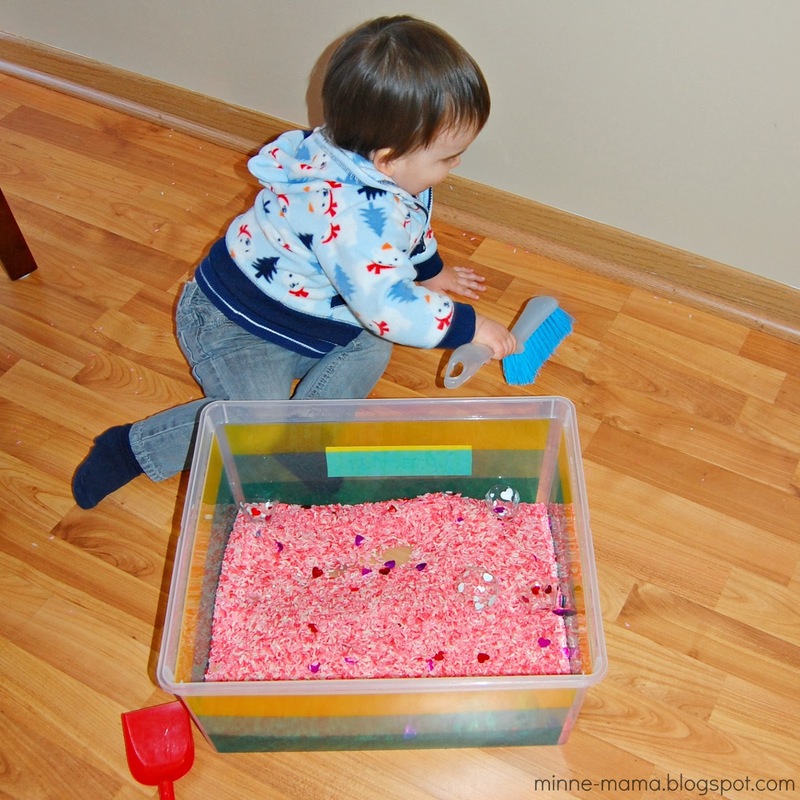 ), and when we play with his Valentine sensory bin, he will run over to his highchair (where the broom is attached with Velcro) and sweep when he sees rice on the floor. This also happens to be the one thing that requires more work on my end, because though he tries really hard, usually the things he is sweeping end up everywhere. Since he has started helping with this, I usually just sweep once at the end of the night. Clothes: When I put clothes from the washer into the dryer, if Skyler is around, I will have him stand next to me and put small things in, like socks or washcloths! Also, when I am folding his laundry in his room, he will attempt to fold everything (i.e. he takes things out of his hamper and throws them all over the room). 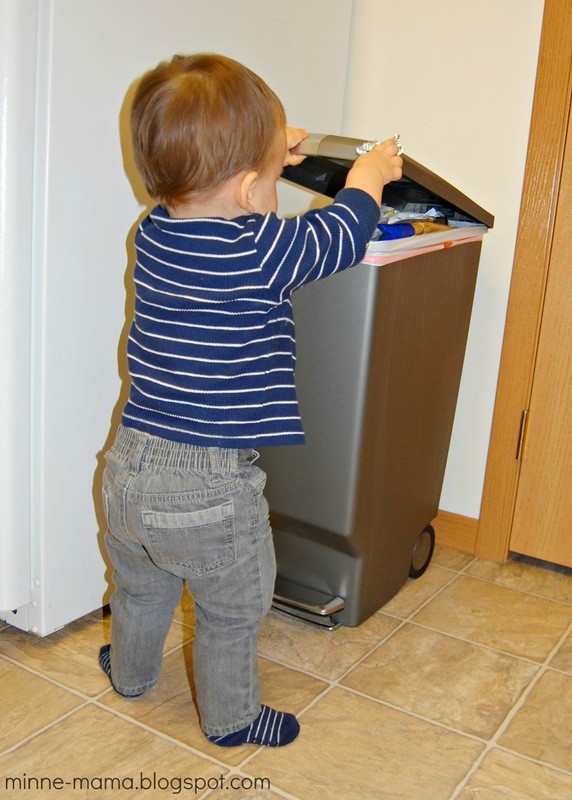 Garbage: Since he started walking in October, Skyler loves to help throw things in the garbage can. The one in our kitchen is typically locked, but if I am having him help I just unlock it while he is helping. This is another task that Skyler does every day. Sometimes it is to empty his dust pan, but I will usually hand him things throughout the day and ask him to throw them away. He happily squeals and runs off to the nearest garbage can! At my in-laws home, there are some magazines in their living room, and Skyler will frequently attempt to put them all in the garbage can! It is incredible how helpful Skyler truly is as a toddler! At this age, it is more for fun, but I hope with this relaxed way of introducing Skyler to 'chore' work, he will be more open to helping when he gets older. It is a great feeling to see how proud he is when he sweeps up a pile of rice and gets it into the garbage can, or when he helps measure out the ingredients for banana bread and watches it cook through the oven door, or when we finish unloading the dishwasher and he gets to shut the door. He smiles so wide and giggles with delight. Really Awesome………very nice post. You are Expert in your profession. It's a very interesting in a post. I appreciate you keep do a posting..